8 T Discs Roast and Ground Coffee and 8 T Discs Concentrated Ultra Filtered Milk Preparation with Sugar, for Coffee Based Drink. Costa Cappuccino. Authentic Costa Coffee taste. 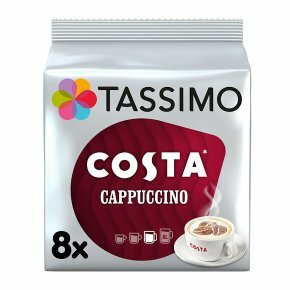 Velvety, frothy topping.Tassimo Costa Cappuccino is a specially crafted blend of coffee beans roasted to perfection to create the same authentic taste of a Costa espresso based Cappuccino, topped with velvety frothy topping. Since it's ground from Rainforest Alliance Certified? coffee beans, every cup helps coffee farming communities build a better future and protect the environment. Explore the rest of the Tassimo Costa range and indulge in more of your coffee shop favourites. From an indulgent Tassimo Costa Latte to your everyday Tassimo Costa Americano.